Welcome to Sunday and another working week. I have only a few days before I pop back to the UK for the weekend (cannot wait: a) my sister is getting married and b) I get to go to Superdrug J so I am counting the “sleeps”. I had one meeting today and then it was a lot of PowerPoint so I went with something a little bit together but also a little bit sloppy and relaxed. It was hard to get a good picture of this outfit. I think it’s the silky joggers – they are super comfortable but perhaps not the most flattering of items in my wardrobe. 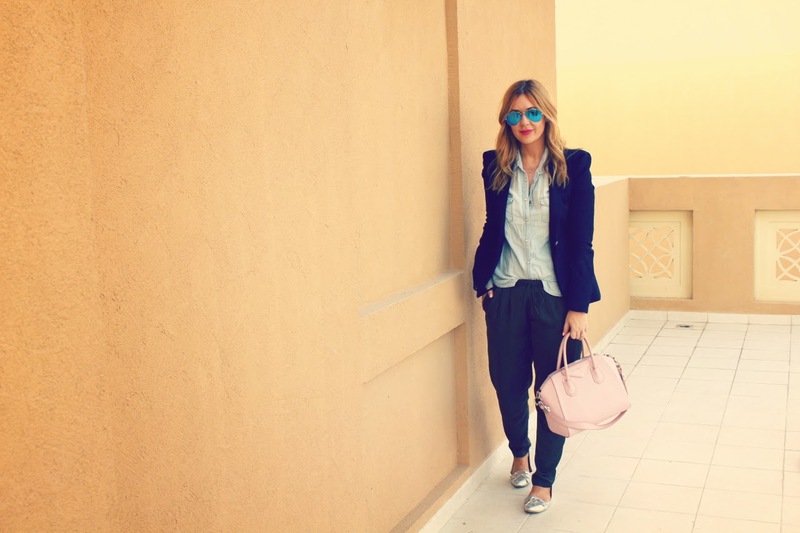 Everything else that I wore is a favourite: the GAP denim shirt (perfect tone and fit) shame-tucked into my joggers, the Zara blazer, the silver flats (go with everything), the blue Ray-Bans and the pink handbag. I also broke out the Bobbi Brown “Razzberry” Creamy Matte Lip Color to add a bit of “something” to my face. I love that product – great shade and great lasting power. Bag: Givenchy Antigona – Link! Lipstick: Bobbi Brown – Link! Right, so back to my UK trip. There are a couple of dead certs that I want to add to my basket: Barry M Coconut nail polish and Dove Summer Glow gradual tanner. After that, I am open to ideas so let me know if there are any major new releases that I need to be alert for! have fun at your sister's wedding! what are you going to wear??? It's a dress from Reiss - a slinky maxi number. Here here! Holiday purchases are like magic. Thanks for the recommendations - I will make sure to give those two a look. Great look, love the bag and the shoes! what is the shame tuck? lol love your outfit!! Thanks Susan! I looooooove (enough "o"s? :) the Gelly formula so I will have a look for that one. Love the Dove Gradual Summer Tanner, I use it in place of my body moisturizer at night and it helps mantain a nice color. I completley understand your excitment about going to superdrug, I am off to San Francisco next week and can't wait to raid CVS ans Sephora. I've already put the Full Cover Concealer by Makeup Forever on my shopping list, what shade do you wear? I love your writing style and that Bobbi Brown lipstick too. The shame tuck LOL! Your shame tuck made me giggle, I think because your observation is so true!!!! I am currently slathered in Dove Gradual Tan and therefore have no other items to add to your list!!! Cute outfit! I always do that! Great outfit! I love that pretty pink bag so much. Enjoy the UK and buy lots of goodies! I love doing shame tuck! Love the outfit! This little bag is everything, you look gorge! I love that bag! I hope it's still around by the time I've finished saving for it! haha! You definitely NEED to check out the Bourjois Rouge Edition Velvets! Not sure if you can get them in Dubai but the Maybelline Colour Show nail polishes are to die for!!! Haha I am loving the title of your post! I am totally guilty of it. Loving the blazer, it looks amazing on you. Great color selection of the Gap shirt. Rimmel Santa Rose Blush, its amazing!